Hereditary predisposition is estimated to account for 10% of all pancreatic cancer cases. However, referral patterns and clinical workflow for germline testing in this disease differ significantly by institution, and many at-risk patients may not undergo appropriate counseling and testing. 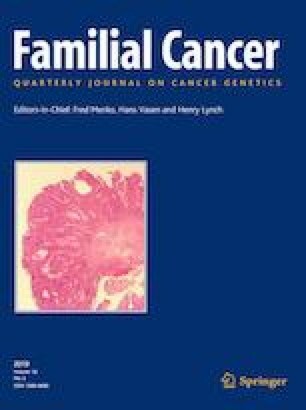 We undertook an analysis of patients diagnosed with pancreatic cancer (PDAC) who were referred to the Clinical Genetics program of a high-volume academic center over a 3-year period to assess referral frequency, evaluate the yield of germline testing in this selected patient cohort, and elucidate the reasons individuals did not undergo recommended germline testing. Medical records of patients with PDAC referred for genetic counseling between January 2015 and October 2017 were reviewed for demographic, medical/family history, and disease-specific data. If testing did not occur, reasons were documented. Genetic test results were categorized as negative, variants of unknown significance, or established pathogenic mutations. Descriptive statistics included means with standard deviations; associations were analyzed with t test and Fisher’s exact test. 32% (137 of 432) of PDAC patients were referred for genetic counseling, but only 64% attended their appointment and 60% ultimately underwent germline testing. Common reasons for attrition included worsening disease severity, lack of patient follow-up, insurance concerns, and logistic/travel challenges. Pathogenic germline mutations were detected in 20% (16 of 82) of patients tested, distributed across races/ethnicities, and significantly associated with younger age and positive family history of breast cancer. PDAC patients frequently do not undergo genetic counseling/germline testing despite appropriate referrals, highlighting a need to develop streamlined processes to engage more patients in testing, especially those with high-risk features. This work was presented at the 2018 Annual Meeting of the American Society of Clinical Oncology (Chicago, IL). The online version of this article ( https://doi.org/10.1007/s10689-018-0106-2) contains supplementary material, which is available to authorized users. Dr. Andrew H. Ko has received research funding (paid directly to his institution, not to him personally) to help support the conduct of clinical trials in pancreatic cancer from Merrimack, Halozyme, Roche/Genentech, and Celgene. During the past year he has received compensation for consulting or serving on advisory or data safety monitoring boards specific to pancreatic cancer from Pharmacyclics, Celgene, ARMO Biosciences, and Astra Zeneca. None of these commercial entities provided funding for this work, nor were involved in the writing of this manuscript. All other authors report no conflicts of interest relevant to the information presented in this manuscript.